MITCH MCCONNELL: Well, what you need to understand is that there are 25 million Americans who aren't covered now. If the idea behind Obamacare was to get everyone covered, that's one of the many failures. In addition to premiums going up, co-payments going up, deductibles going up. And many Americans who actually did get insurance when they did not have it before, have really bad insurance that they have to pay for and the deductibles are so high that it's really not worth much to them. So it is chaotic. The status quo is simply unacceptable. This is, I think, the correct case to make against Obamacare. It really didn't cover everyone. Premiums, co-pays, and deductibles really are too high — 43 percent of enrollees have a deductible above $2,500. There are a lot of people being pushed to buy insurance that will break their budget before they ever get to use it. But here, then, is the question McConnell needs to answer: Is he promising the Republican replacement will feature more coverage and lower premiums, co-pays, and deductibles? I asked McConnell's office this question and didn't get very far with it. His spokesperson, Don Stewart, said: "The smart play with McConnell is not to go looking for interpretation, but rather just listen to what he says." Okay, I replied, but if McConnell is saying that the status quo, with 25 million uninsured and high deductibles, is unacceptable, then is it reasonable to assume he would be against a replacement that led to less coverage and higher deductibles? "He's been clear not to pre-define the replacement measures other than to say it won't be one single bill," Stewart said. In an op-ed released today, McConnell criticizes the Affordable Care Act almost entirely by quoting Democrats criticizing high premiums, sparse competition on certain exchanges, and insurance that's often too expensive to us. But, again, he refuses to say whether he will insist that any Republican replacement actually fix these problems. It's typically true in politics that when elected officials criticize a bill for its specific outcomes, they want to pass legislation that responds directly to those criticisms. But it's not true here. Republicans are caught between the criticisms of Obamacare that are popular to make and the plans they actually want to pass. I've read a number of the Republican replacement plans floating around. All of them would lead to more Americans without health insurance coverage, much higher deductibles, or both. Take Rep. Tom Price's Empowering Patients First Act. Price, a Georgia Republican and former surgeon, is Donald Trump's nominee for secretary of Health and Human Services. His legislation is among the more detailed Obamacare replacement proposals. It repeals Obamacare's Medicaid expansion, its subsidies, its insurance regulations, and its consumer and out-of-pocket protections. In place of all that, Price creates an age-based tax credit for people buying insurance on their own (you aren't eligible if your employer or the government pays for your care) that ranges from $900 for children under 18 to $3,000 for those 51 and older — a tax credit, in other words, that doesn't come near covering the cost of decent insurance coverage. 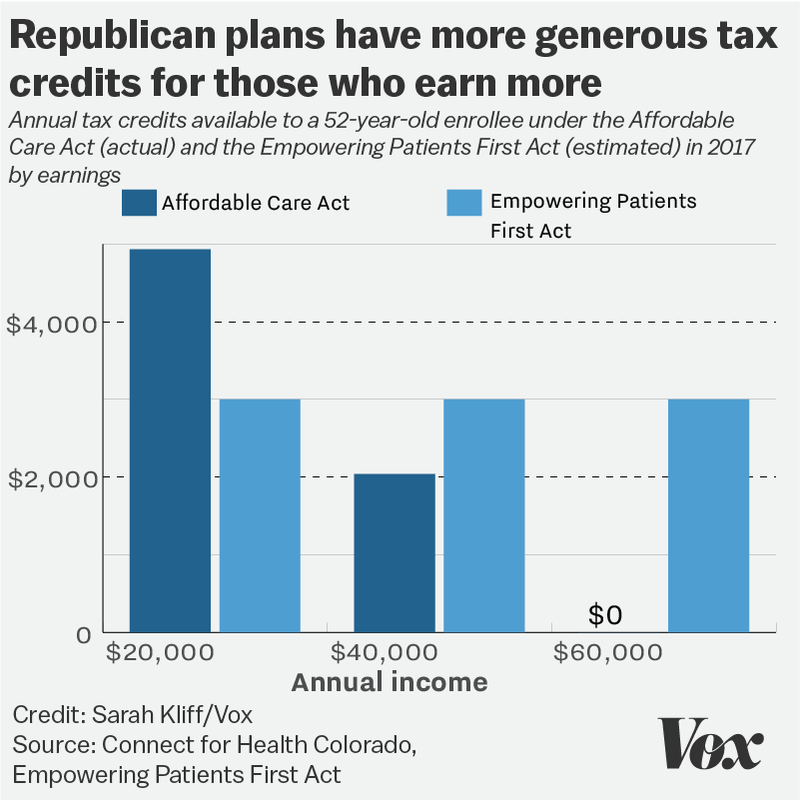 Obamacare's tax credits are more generous for people who earn less money. But Price's are the same for everybody — and you can see how that creates new winners and losers in this chart. The Empowering Patients Act does less for those who need help most and more for those who need help least. It's possible that's a politically popular path to take. But helping folks who make $50,000 a bit more will come at the cost of watching a lot of people who make $20,000, or nothing, fall through the cracks entirely. Deregulating insurance interacts with all this in tricky ways. Imagine a 52-year-old unemployed steelworker in Ohio who currently receives Medicaid. Right now, he gets health insurance with virtually no out-of-pocket costs. Under Price's plan, he gets $3,000 to buy care on the open market. Right now, the cheapest plan available in Franklin, Ohio for a 52-year-old male is $4,738 with a whopping $7,150 deductible. It's an awful plan, and even that may not be affordable. Price has an answer to that. He's also repealing most of Obamacare's regulations governing the services insurers must cover. There are no limits on out-of-pocket costs, as there are in Obamacare. There are no essential benefits, as there are in Obamacare. Insurance that covers less costs less. But this goes both ways. Obamacare, for instance, limits how much more an insurer can charge a 52-year-old than a 20-year-old. That makes insurance more costly for 20-year-olds but much cheaper for 52-year-olds. Price repeals those regulations. A 52-year-old shopping for insurance is thus likely to be offered coverage that costs more and covers less than what's on offer now. That is what most Americans call "really bad insurance." Will McConnell be more comfortable with a system that pushes those kinds of plans? Will Donald Trump? Will voters? There is no "terrific" alternative to Obamacare. There are just plans with different, but equally painful, trade-offs. There's much that's complicated in the world of health policy. But the cost of insurance is relatively simple. Insurance is expensive because medical care is expensive. In 2016, the average employer-purchased policy cost $6,435 for an individual. That's a good benchmark for what most people consider decent coverage. Coverage that costs less than half that much — if you can find it — is cheap because it covers fewer medical costs, fewer medical treatments, or fewer people who really need medical care. There's no magic here. Donald Trump likes to say he's going to repeal Obamacare and replace it with "something terrific." Sadly for everyone, that's probably not possible. What is possible is repealing Obamacare and replacing it with something that makes a different set of equally painful trade-offs. Price's plan, to its credit, is clear about its trade-offs. It costs less than the Affordable Care Act but covers far fewer people, and the people it does cover get much stingier insurance. It lowers taxes on the wealthy, but kicks the poor off of Medicaid. It makes coverage cheaper for younger, healthier people by repealing regulations that keep it affordable for older, sicker people. It lowers insurance premiums by allowing insurers to increase deductibles and reject more claims. It gives more subsidies to the middle class and rich but gives much less to the poor. Price's plan also has a version of Obamacare's hated "Cadillac Tax" — it caps the tax-exemption for employer-provided insurance at $20,000 for a family and $8,000 for an individual. If your problem with the status quo is that 25 million people remain uninsured and too many Americans are finding that their only choice is "bad insurance" with deductibles so high that they can't really use it, you're not going to like Price's plan much. Is that McConnell's position? You would think so from listening to him on Face the Nation. In truth, I think that's not actually his position: He is pointing out the failings of Obamacare that are unpopular, and thus leave the law politically vulnerable. I think his real problems with Obamacare have more to do with its taxes and regulations, and he would be willing to see less coverage, and less usable insurance, if that was the path to lower taxes and less regulations. But that may not be a popular path forward. 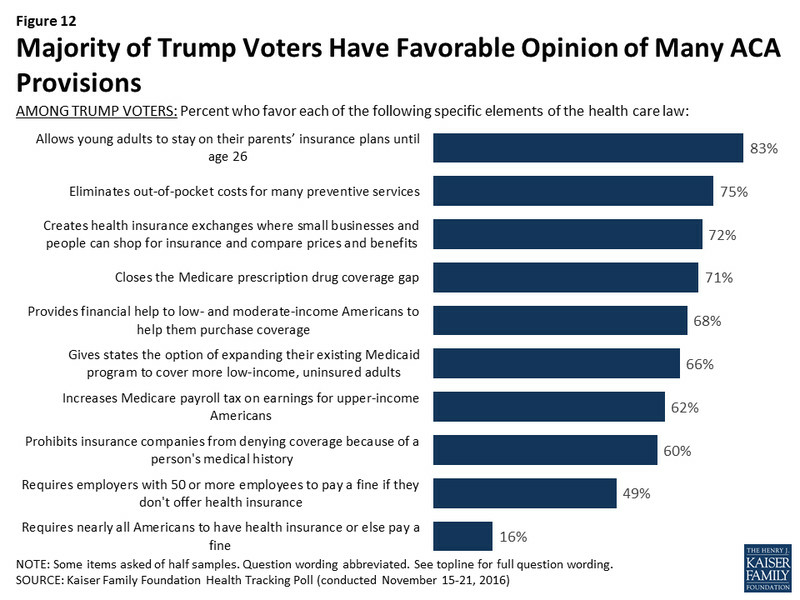 The Kaiser Family Foundation polled Trump voters on the Affordable Care Act, and their priorities diverge sharply from those of congressional Republicans. The Medicaid expansion, Medicare taxes, and out-of-pocket limits are among the Obamacare provisions that elected Republicans like least. But all three are popular even among Trump supporters. In our interview last week, President Barack Obama outlined the trade-offs he would like to make to improve Obamacare. He wants to raise taxes on the rich to increase subsidies to the poor, and to add a government-run public insurance option. Pumping more money into subsidies would certainly lead to more people being covered and lower premiums and deductibles, but I doubt McConnell would like it. As I've written before, what Republicans hate about Obamacare and what Americans hate about Obamacare are different. But this is a tricky two-step. Republicans have spent years now bemoaning the parts of Obamacare Americans hate. It's going to be very difficult to pivot to a health care system that make those things even worse. Commentary by Ezra Klein, the Editor-in-Chief of Vox. Follow him on Twitter @ezraklein.